Hello travel fans and welcome to a much sunnier Monday Escapes than we’ve had in a while. I do hope Spring has arrived where you are too. Here in Devon we’ve got a little giddy about the warmer weather and have broken out the summer wardrobe. I’ve got to admit that one of the main reasons is to check that it still fits ahead of my cruise in a few weeks time! I’ve also had confirmation of a trip to Costa Barcelona the following week so it’s flip-flops and shorts for me from now on *crosses fingers*. This week Karen from Mini Travellers and I are your hosts and you will find the linky tool to add your posts at the bottom of this page. In the second week of the holidays we were invited to review the new Being Brunel Exhibition at SS Great Britain in Bristol. If you’re in the city I can highly recommend a visit to the ship having been there a few times before. The new exhibition is a great addition with plenty of interactive features for kids to enjoy. While in Bristol we stayed at the fabulously central SACO Apartments on Broad Quay. We could see a glut of the city’s family attractions from our 8th floor balcony and loved the stylish decor – I wanted to move in! We rounded up our Easter holidays with a day out at Greenway House and Gardens. It was the holiday home of crime writer Agatha Christie and is an extraordinary place to visit. The house is packed full of curiosities and the gardens have wonderful views of the River Dart. I’ve written a bit about it before. However this was our first real time looking around the gardens and we’ll definitely be returning to see them during the different seasons. I’ve been desperately trying to catch up with posts about our Easter travels and my trip to Italy in March but have not quite covered it all yet. If you do want an overview take a look at where we stayed at Easter and our days out at The Minack Theatre, Bodmin & Wenford Steam Railway and Pirates Quest in Newquay. Over on Cruising with Kids we’ve got some tips for you to avoid jet lag – essential if you’re not cruising out of Southampton. The linky is run by myself (Tin Box Traveller), Sarah (Extraordinary Chaos) Karen (MiniTravellers) and Lisa (Travel Loving Family). We are all absolutely delighted to link up with Lonely Planet to offer our number one favourite blog post of the fortnight either a destination guide, or a title from the Lonely Planet Kids range. (See T&C’s below). 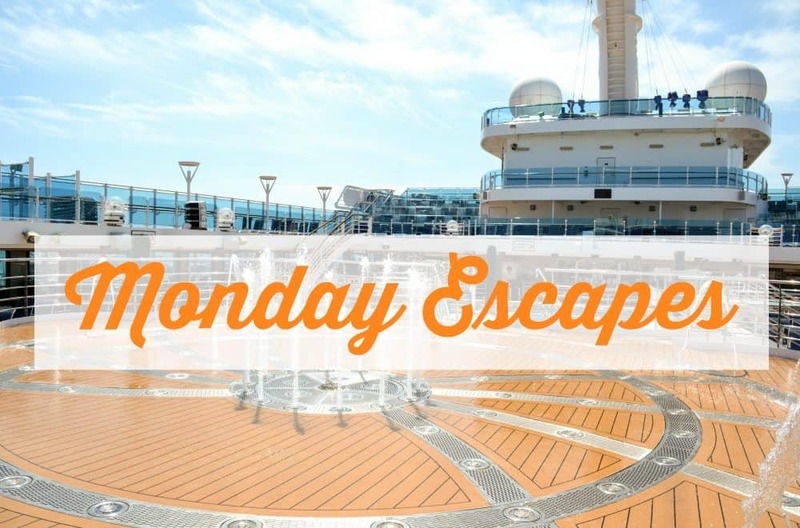 Just another great reason to link up with Monday Escapes! Lisa loved this road trip guide to La Mancha by Memories of the Pacific. She said: “Cristina is 50% Manchego and visits the region every year. She shares her top tips for the best places to visit and eat. Her photos are superb and will make you want to join her on a road trip!”. Congratulations to Christina from Memories of the Pacific – you are our winner this time. Get in touch and I will organise your Lonely Planet guide prize. Link up one post/photo – old or new using the InLinkz tool on Tin Box Traveller. There is also a MondayEscapes Pinterest Board – so if you’d like to start pinning some of your favourite photos, do get in touch.